One of my grandsons loves to live on the wild side. Roller coasters are his favorite rides. I think if you took him to a theme park, blindfolded him, spun him around and turned him loose, he would head straight for the roller coaster or, the most heart stopping ride in the park. He seems to thrive on the excitement. His mom lovingly refers to him as her adrenalin junkie. He is one cool kid! There are many things that excite us. 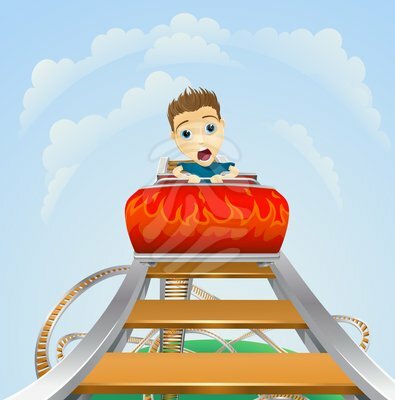 For my grandson it’s the thrill of the ride. For others it’s a football game, a trip, a great concert or the birth of a baby. We have all experienced those moments that defy explanation or description but were accompanied by those butterflies in our stomachs. We have experienced those moments in our spiritual lives as well. Most of us can look back on our salvation experience as an exciting spiritual high. Not only did we feel relief that our sins were forgiven, but excitement and passion for our God who loves us sacrificially and unconditionally. We wanted God more than we wanted air, or food or water. Other mountaintop experiences may have fueled our walk with God along the way – a Vacation Bible School, a summer youth camp, a women’s retreat, or a Bible Study where God revealed truths about Himself that were new to us. But as time goes by, like my grandson when the ride is over, the excitement may fade. We may “lose” that fire for some reason and it scares us. We don’t know why. There may be multiple causes acting together to create a crisis of faith. We experience discouragement when things do not go as we had planned or hoped – especially when it is related to our work for the Lord. Elijah and Jonah both experienced this. We may have allowed ourselves to become minimalist Christians. We equate our Christianity with going to church. If that is all Christianity is to us, it becomes routine, dull and boring pretty quickly. Christianity is not defined by rules and rituals – it is a relationship. Excitement and passion are found in the relationship. We have allowed something precious (the gospel) to become familiar or commonplace. We may have failed to grow in God’s word and to continue to grow spiritually. When a person stops increasing their knowledge of God’s word, they become spiritually stagnant and zeal and excitement decline. We may have had the experience of having tried hard but not having seen very much tangible results in our work for the Lord. When this happens it is tempting to want to give up and let someone else do the work. For some, the older we get the less our zeal. We adopt an attitude that says, “Let someone else do it…I have put in my time.” Remember Caleb. At the age of 40 he was one of the 12 spies who wanted to take the promised land – when he was 80, he marched across the Jordan with Israel. Unrepented sin will extinguish our passion. We could go on, but I think we all get the point. If we have lost our passion, no matter the cause, we must consider – how do we get it back? We must go back to the beginning and remember the original source of our passion and excitement. It was the gospel – when we first learned that God provided an escape from our sin because He loved us so much that he allowed His only Son to die for us. That message of love creates a love for the Lord in return. (1 John 4:10, Romans 2:4) His love for us prompts a response of love, joy, gratitude, and passion. We must pray for a return of the joy of our salvation and a passion for the things about which God is passionate. Jesus said, “My food is to do the will of Him who sent Me, and to finish His work.” (John 4:34) He was passionate about His work. We must remember what God has done for us as we have walked with Him. We must make passion for Jesus Christ a priority in our lives. Consistent enthusiasm and passion come from within as a result of our relationship with Jesus Christ, rather than being dependent on changing circumstances. Inconsistency confuses, discourages and de-motiviates. Let us be women of passion and excitement for the Lord! Truth to Claim: Our passion for Christ is not dependent on our circumstances. Application: Commit to live with passion regardless of the circumstances.